Sport: The hot weather has kept most anglers away this week, however the reservoir is producing some good bags of trout and most fisherman are being rewarded for their efforts. As always, there is more than one way to skin a cat and two methods have emerged over the last few days that have proved productive. On Wednesday Gavin Murray was the top rod with six rainbows to his boat. Gavin found that sinking lines combined with a variety of different lures caught him fish. Gavin commented on how many nips and pulls he had had as well as the six fish he landed. Bob Fitzpatrick was also a float on Wednesday and got hold of five trout over a short session but unfortunately three of them parted company before he could get his net under them. Bob fished a sink tip line with a team of black buzzers and concentrated his efforts over the deep near the buoy line and Newclose Bay. These two different methods continued to score well over the next couple of days. On Thursday Jamie Presho took five rainbows and got bust by another whilst bank fishing from the dam wall. Jamie used a Di5 sinking and white snakes to great effect, counting the line down and then jerking the snake back. He commented that several other fish followed his lure up before turning away. The water in Stocks is so clear now that the visibility is excellent. On Friday the top catches came from the boats once again. New member Charles Holmes took five good fish on Diawl bachs whilst boat fishing near the Spillway. Charles fished them really slowly on a floating line, allowing them to sink right down. It was described to me as sitting on them. Also on afloat on a boat was Peter Andrews. Peter used both a floating line and a Di5 to catch six rainbows to 3lbs. His best patterns on the floater were buzzers and on the Di5 were damsels. He found fish hold along the east bank. Bank House Fly Fishery has been producing some good catches and good fish too. Throughout June the rod average at Bank House was 4.1 fish per angler. In think the best reported session was probably made by Mr Ellison from St Helens. 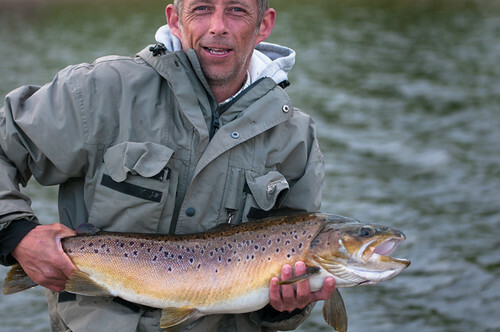 Mr Ellison visited Bank in the middle of the month and fished a hothead damsel pattern to catch thirteen fish and his best brown trout tipped the scales to 11lbs 8oz. There were a lot of catches of six, seven and eight rainbows throughout the course of June hence the good rod average. Mr Banks from Morecambe had eight fish and his catch included rainbows to 4lbs and browns to 8lbs. Mr Francis from Lancaster had seven fish including a 6lb brown trout and rainbows 4lbs. A variety of methods were successful. When the cloud cover allowed dries produced some great bags of fish. Foam daddies were a favourite pattern and these daddies continued to catch well sub surface when the cloud disappeared and it brightened up. July has got off to a flying start and although the fishery has been quiet the anglers that have ventured out have caught well. The rod average so far in July is 5.33. Gary Martin and Felicity Appleton had twelve trout between them on pink lures fish on sinking lines. Mr D Allan used black/white buzzers to catch 10 trout. His catch included a brownie of 7lbs 8oz and rainbows to 3lbs 8oz and His fishing buddy Chris caught six fish to 4lbs on damsel patterns. If you are planning to visit us during July, the best patterns have been damsels and buzzers but dries will still work well in the shadows of the trees and islands. Try small wets like bibios and hoppers or small foam daddy long legs twitched back subsurface. I find that fishing lighter leaders at Bank House always results in more takes. 4lbs is a good compromise. There are a lot of big browns in the fishery at the moment, which means getting broken is a risk. However if you just fish a single fly you can still play them quite hard and quickly return them if you are fishing on a sporting ticket. This entry was posted in Stocks Reservoir Fishing Reports on July 7, 2018 by staff.